Summary: Every page is a poster in the Finding Dory Poster-A-Page book featuring beloved Disney characters from Dory and Marlin to Bruce the Shark. Finding Nemo fans can relive the underwater adventure, learn a few new things about the meaning of family, and decorate their walls with seven supersized, pull-out posters of their favorite images from Disney-Pixar's new movie, Finding Dory! -- Disney/Time Inc.
We just returned from Disney World a few days ago, and one movie that everyone was talking about is Finding Dory. We were even there for National Speak Like a Whale Day. Today is the release date for this fun movie and I can't wait to see it. Who didn't love Finding Nemo and Dory's scenes? In honor of the release of Finding Dory, I wanted to share with you the new poster-a-page book called DORY'S ADVENTURE. This adorable book has posters of scenes from the movie Finding Dory on every page. It also has seven large pull-out posters with popular characters including Dory, Nemo, and Bruce the Shark. There is even a poster with six characters that kids can color! DORY'S ADVENTURE is primarily a collection of assorted posters; however, it also has a few fun pages that relive memorable scenes from the movie. In addition, I liked that there were some pages that taught kids about animals that live in the ocean. For example, there is a page about the Blue Tang Fish that teaches children about their average size, how much they weigh, and why it's called a Blue Tang Fish. 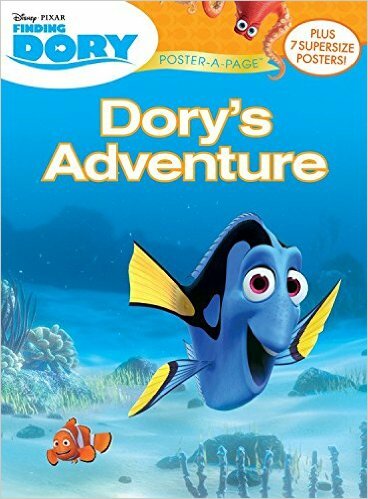 DORY'S ADVENTURE is certain to thrill young fans of Finding Dory! I have a copy of DORY'S ADVENTURE to share with one lucky reader. To enter, just fill out the form below before June 30th at 11:59 p.m. EST. I will randomly select and notify the winner the following day. This contest is open to those of you with U.S. addresses only. Good luck!